What are the risks of multiple c-section? I wonder if anybody ever mentioned them to Tori Selling. Everybody seems obsessed with celebrity birth. People accuse Ricki Lake of highhandedly increasing the home birth rate. Everybody talked about Ms Jolie's planned African water birth. Celebrities, though richer and better looking than the rest of us, still get to be judged by their birth choices. And also, sadly, they still can be hurt (even endangered) by the sorry state of current obstetrics and anti-VBAC sentiment. A few weeks ago we talked about Tori Spelling and how her 4th cesarean section landed her back in the hospital for emergency surgery. It has since been revealed what her re-hospitalization was for. Apparently her "C-section scars burst open" requiring her to return to the hospital. In addition to revealing why she was re-hospitalized after her birth, Tori also mentioned how difficult this fourth pregnancy was for her. Tori spent four months on bed rest due to placenta previa. Placenta previa is a condition in pregnancy where the placenta grows over the cervix. It can be deadly, as you can imagine, due to the risk of hemorrhage. A full placenta previa eliminates the option of vaginal birth. As you can image there were lots of nasty comments directed at Ms Spelling following her birth. (Probably because some people are mean and trashy.) People said she had too many babies. People blamed her for the complication because she had her children too close together. People accused her of going back to the hospital just to get a tummy tuck. She is not responsible for the outrageous c-section rate in this country. Tori is not to blame of the total LACK of options regarding VBAC for birthing women. 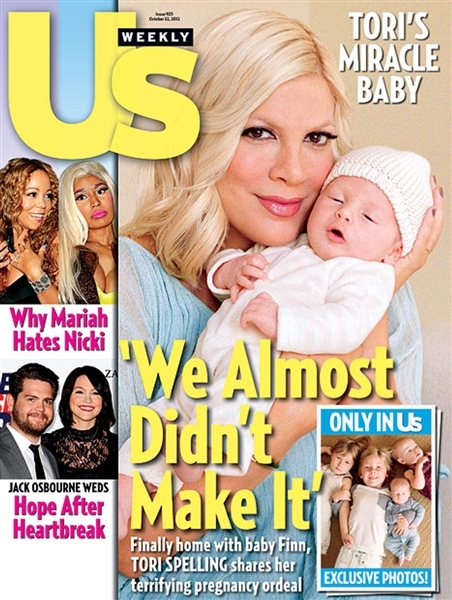 It is not Tori Spelling's fault that she had placenta previa either. "The rate of placenta previa at second birth for women with vaginal first births was 4.4 per 1000 births, compared to 8.7 per 1000 births for women with CS at first birth." Simply having ONE c-section almost doubles your chance of placenta previa. DOUBLES. What about women who have two or three or more c-sections? Is anybody talking about the very real and very scary risks of repeat c-section? We hear a lot about the risks of VBAC. We hear a lot about the risks of home birth. But we stay mum on the subject of the increasing risks of CESAREAN. It is time we opened out mouths and started talking about this. It makes me absolutely ill that this mother spent her pregnancy in fear of losing her baby and her own life. And it makes me so sad that this worry and this risk was most likely caused (and certainly increased) by a medical intervention that may or may not have been needed. How many women are dying because we ignore the risks of cesarean and talk about the risks of VBAC? How many pregnancies are dangerous because we remove the option of VBAC and make c-section look easy, even desirable. I wish all women healthy and joyful pregnancies. I am so very grateful that we have access to modern medical care WHEN NEEDED. And I hope that we use these interventions when they are NEEDED, and not at other times. I hope that we can stop sacrificing women and babies because we don't want to give them options. Wishing Tori and her family a joyful and healthy recovery. Poor Tori! It's hard enough being a mom to a newborn and having the emotional rollercoaster from your hormone crash, etc., etc. than to have the WHOLE WORLD criticize and judge you... and nothing you say can change that opinion. It's a BROKEN SYSTEM; I don't see why people are wagging their fingers at the momma. Who knows? Maybe if she didn't have PP she would have wanted a VBAC?! And even if she didn't it is HER body and HER birth. Not that there isn't inherent risk, as there is, but I just don't see how it is helpful for so many people to trash her. And I totally agree about how everyone is quick to put disclaimers about home birth and natural birth, etc., etc. but if you utter a word of risk about induction or cesareans or anything else that is medically indicated everyone spazzes out and loses it. I don't GET it!!! Amen! Before having my 4th baby I did some research into whether a 4th caesarean was "allowed". The more I read and learned, the more I realised that the risks of that 4th CS far outweighed the (tiny) risk associated with VBA3C. I fought tooth and nail to be "allowed" to give birth in the way that I chose but got my VBA3C in 2006. Such a great post, thank you. And something I wish more women were aware of, especially first time mamas - instead of selling the c section to them as 'an easy way out', they should be aware that it can change the direction of their whole birth career, which is important if you want more than one baby and critical if you are planning 3 or 4. Since my VBAC six months ago, I am still amazed every day when a different woman (usually a fellow mother) says,' oh you had to have a repeat c section, right?' They are always surprised when I say, no, not for me, it was safer to do it normally. And drug free. And it was awesome. I wish women were MUCH better informed. what a scary birth for her. i wish it had gone smoother, been a more calming and lovely experience instead of the nightmare i am sure it felt like. i think it is a shame that we have become so accustom to these sorts of things. how birth horror stories are all over the place and how so many of them might have been prevented if we could just view pregnancy and birth differently. our system is so broken. I'm sorry, but Spelling would not likely have been a candidate for safe VBAC given how close together her pregnancies were. I'm all for educating people about their options regarding VBAC and RCS, but she is hardly the poster child for safe decisions post-c/s. You need to find a WAY better example to make your case. Her reckless decision to not use protection four weeks post-third c/s has nothing to do w/ c/s rates in this country or VBAC education. I appreciate your passion, but you do a disservice to the discussion here. Tori Spelling was irresponsible, and that's all there is to it. This doesn't have anything to do with fixing the culture of birth in America, if indeed it needs to be "fixed" at all. In all honesty, I'm sure her doctors were doing all they could, given the dangerous circumstances, to deliver baby safely. But the TRUTH of the matter is that many women are told after the FIRST (not the third or fourth and with no birth spacing taken into account) cesarean that they must ALWAYS have c-sections. OR they are told they can "try" for a VBAC and then they are sabotaged the whole way. Have you talked to women planning VBAC after just ONE c-section? Because where I teach there is ONE hospital out of 5 or 6 in the area that even ALLOWS VBAC. And then you must be continuously monitored and deliver spontaneously by 41 weeks. Truth is those things alone make it impossible for most women to VBAC because- A) their insurance doesn't cover that one hospital B)they carry babies slightly longer than that or C) constant (let's be real - SUPINE) monitoring really makes it next to impossible to actually progress. So while Tori's LAST birth (her 4th c-section with a placenta previa and a very close birth spacing) most certainly needed to be a c-section I think I could make a pretty strong argument (and I did) that she (and all women) should have been given the option and availability of VBAC after her first c-section. So there. I think a lot of women are so angry with Tori because they can't believe this is not her fault and that this could just as easily be them. Yes this was her 4th, this could have happened with her 2nd. Few women want to believe that they may not be able to trust their dr's, that their birth choices were not the safest, or that their past birth choices may negatively affect their health in the future. It's so much easier to hate a celebrity. From what I have heard, her first c-section was due to a failed induction with her first pregnancy. Then, it just went on from there with a RCS and an 2nd RCS and now a 3 RCS. I am with you 100%. We should be talking about placenta previa, placenta accreta, increased rates of ectopic pregnancy, increased rate of hysterectomy and not to mention the hundreds of other complications from major surgery. Thank you for your post. I hope it gets people talking and learning! Multiple c-sections is one issue, placenta previa is another. I had a complete previa with my second pregnancy (after a vaginal birth) with none of the indicators. I was told that they don't always know what causes a previa, as I had nothing to indicate that I would get it. I spent two months on bed rest and my son was born via emergency c-section at 34 weeks. Having babies is a serious and joyful occasion, but I won't have another to risk my health. Placenta previa, acretia, and many other problems are increased with each cesarean birth. She needed that fourth c-section. It is however unlikely that she would have had a previa if not for all the other cesareans. While her previous c-sections may have contributed to her placenta previa, I too had a baby this year after a complete placenta previa and had never had a c section before. So its not impossible, it is scary, and I wish more people understood the condition. When you say "doubles" you fail to mention that the risk remains very, very low. You should relax with your judgement and let women decide how they want to deliver. While there is risk with a C-Section, it is actually safer for the baby than a vaginal birth (no risk for hypoxia etc.). Vaginal birth can hold as much risk as a C-Section. So while your intentions are probably good - you should worry about you and let other women make their own decisions without judgement.